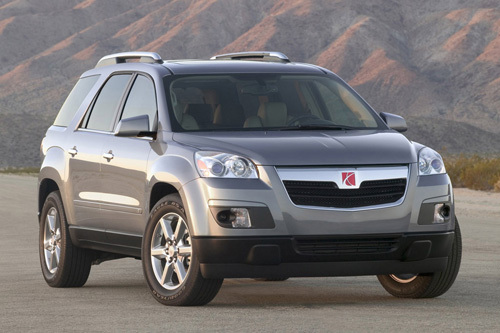 General Motors announced today it is recalling 1.18 million of its Lambda-based large crossover sport-utility vehicles, including: Saturn Outlooks from the 2008-2010 model years, Buick Enclaves and GMC Acadias from the 2008-2013 model years, and Chevrolet Traverses from the 2009-2013 model years. A few days ago we took at look back at some of the first Saturn brochure covers. Today we have a sneak peak at what would have been the cover and front spread of the 2010 Saturn brochure. Saturn was reportedly gearing up for a big marketing push in 2010 once the Penske acquisition was completed. Here is a step-by-step how-to guide that I put together after changing the oil in my 2009 Saturn Outlook with GM's 3.6L Direct Injection (DI) V6. The procedure should also work for anyone with who owns a GMC Acadia, Buick Enclave, and Chevrolet Traverse. This process worked for me, but I cannot accept any responsibility for the procedure or provide any guarantees. Jessica Anderson from Kiplinger's Personal Finance: If you're in the market for a new car, GM's loss could be your gain. Saturn's dealers have until the end of October 2010 to close, now that a deal has fallen through to sell the car line to the Penske Automotive Group. But many showrooms could close by January because inventory is low. That means the sooner you shop, the better your choices. David Thomas from Cars.com: Current owners' warranties are still fully backed by GM and will be serviced by other GM brand dealerships — Chevrolet, Cadillac, GMC and Buick. As of September 1, Saturn's total inventory was 14,700 units, according to Automotive News data. Saturn representatives say there is an inventory of 12,000 vehicles on dealer lots and in transit. Published dimensions indicated are without optional equipment or accessories. Additional accessories or equipment ordered at the customer's request can result in a minor change in these dimensions. The Saturn Vue, completely redesigned for 2008, makes history just one model year into its launch when the 2009 Saturn Vue 2 Mode Hybrid goes into production in late 2008. It is expected to be the world's most fuel-efficient V-6 SUV, providing an estimated 50-percent increase in fuel economy compared to the non-hybrid Vue XR. There are currently 15 users and 285 guests online.